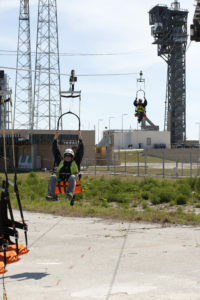 Engineers tested a new slide wire emergency escape system at Space Launch Complex 41 as United Launch Alliance continues to modify the pad for upcoming launches of Boeing’s CST-100 Starliner spacecraft aboard ULA’s Atlas V rockets on missions to and from the International Space Station. There are seats in place on four wires so up to 20 astronauts and ground support personnel can quickly get down from the tower in case a dangerous situation develops during the countdown. The system has been designed with the astronauts’ suit in mind, including making the seats easier to get into and the handles that control speed on the way down easy to operate. The crew access tower is new to the launch complex, which has hosted uncrewed spacecraft and rockets for years. The egress system is located on the same level as the crew access arm, which provides the connection for astronauts to enter the Starliner spacecraft on top of the Atlas V rocket. 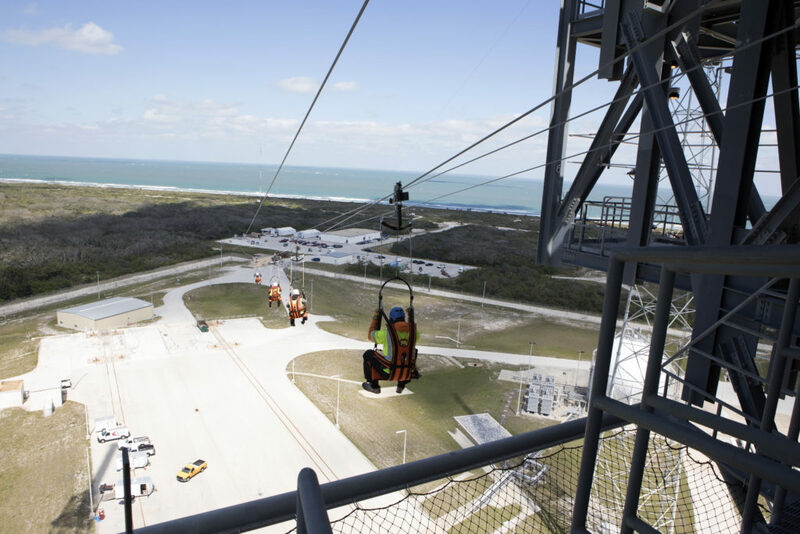 It is the first new emergency evacuation system that has been installed at the Florida spaceport since the slide wire baskets used during the Space Shuttle Program.